Happy National Coffee Day! 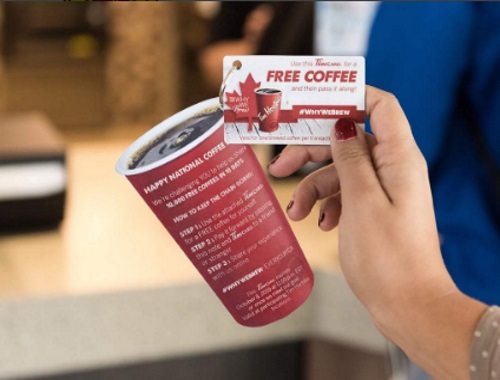 Tim Hortons has planted 100 special-edition Tim Cards across the country and they're challenging you to pay it forward and help share 10,000 free coffees in 10 days! People who receive the card can first treat themselves to a free coffee, and then pass the card along to a friend or stranger to do the same. Let your kindness shine, Canada! These will be distributed across Canada through October 8.